New to Battle? Enroll Today! Whether you own/manage a manufacturing facility, small mom & pop shop, or even a theater, ANY building is welcome to join this FREE competition. Will YOU be the Biggest Loser of 2019? 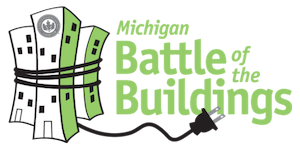 Simply complete form below to enter your building in the 2019 Michigan Battle of the Buildings competition. Please use 1 form per building (exception: a campus with campus-wide metering may use 1 form for the entire campus). If you are entering multiple buildings please send us an email at the address below and we can streamline the process for you. *If you have buildings that competed in the 2018 competition they will be rolled over into the 2019 competition. No need to re-register! Check if all the buildings you want in the 2019 competition participated in 2018 here.